An investigation into the cause of Monday's fire is underway, but officials have so far suggested that it was likely an accident. The Australian Jewish Association alleged that a part of France's Arab population has been celebrating the fire which partially destroyed the iconic Notre Dame Cathedral. The non-profit tweeted a screen capture video purportedly showing how Facebook users — some of them assumed to be Arabs or Muslim, judging by their names — reacted to the news with laughing emojis. "There is a segment of French population rejoicing the destruction of historic Notre Dame Cathedral," reads the caption. "Videos on social media have reactions using smiling/laughing emojis by users with Arab names." — Australian Jewish Association (@AustralianJA) 15 апреля 2019 г. The video appears to have initially been uploaded by French right-wing activist Damien Rieu, who wrote "Guess who's happy about the fire", apparently referring to the users with Arabic names. Its authenticity could not immediately be verified. The 850-year-old edifice, one of the most cherished French monuments, caught fire on Monday. 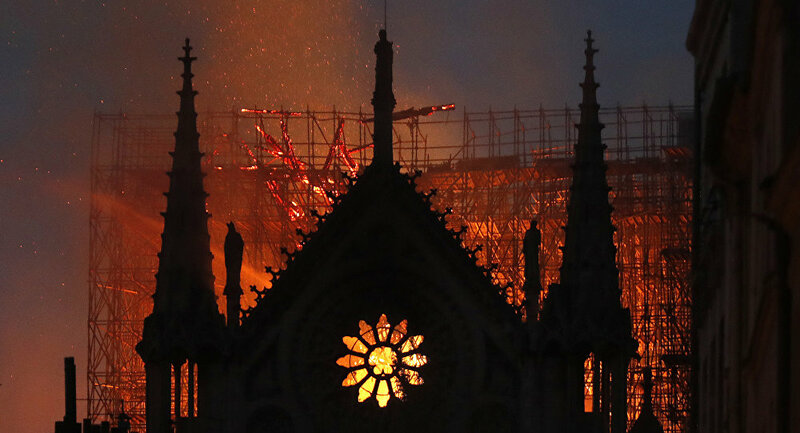 It took firefighters roughly nine hours to put out the blaze, which managed to destroy the spire and severely damage the roof. French officials said there was no evidence to suggest that the fire was caused by arson and the incident was linked to restoration works.